Southampton is a city in the United Kingdom. The city is in Hampshire. It is about in the middle of the south coast of England. 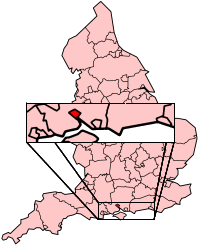 Southampton is the largest city on the south coast. It is an important port. It is the nearest city to the New Forest. In 1912, the RMS Titanic sailed from there as was common with most ocean liners at the time. It contains several memorials and museum exhibitions related with the doomed ship. Southampton has lots of landmarks, of which one is the Bargate. This is the old main gate of the city wall of Southampton, and nowadays is used as the beginning of the guided tour of Southampton, Walk the Walls. In medieval Southampton, a bell was rung at dusk every day to tell people that the gates would shortly be locked. Today, the Bargate Shopping Centre is nearby. Named after The Mayflower, which set sail from Southampton to the "New World" (via Plymouth), the Mayflower is the theatre in Southampton. It was built in 1928. Southampton is home to many cruise ships and ocean liners, including the Queen Victoria and the Queen Mary 2. There is also a regular ferry service to Hythe (a small village on the other side of Southampton Water), which leaves every half hour. Southampton has a football team Southampton F.C., which is nicknamed "The Saints". In 2001, the team moved stadiums, from "The Dell", to St. Mary's Football Stadium. The club was founded in 1885, and has been playing ever since. ↑ "City statistics and research". Office for National Statistics. Retrieved 16 November 2013. ↑ "British urban pattern: population data" (PDF). ESPON project 1.4.3 Study on Urban Functions. European Union – European Spatial Planning Observation Network. March 2007. pp. 120–121. Archived from the original (PDF) on 24 September 2015. Retrieved 14 May 2011. ↑ 5.0 5.1 "Global city GDP 2014". Brookings Institution. Archived from the original on 4 June 2013. Retrieved 18 November 2014. ↑ "Southampton - In Brief". stga.org.uk. Retrieved 20 January 2011. ↑ "Home". 8 May 2015. ↑ "SOUTHAMPTON FC - Official Website of Saints – latest news, photos and videos". Southampton FC. ↑ "Grad Rijeka". rijeka.hr. Retrieved 17 December 2010. This page was last changed on 11 February 2019, at 20:33.